Dr. Katri Selander of Blondin Bioscience LLC, a startup that did not win Alabama Launchpad Competition funding but persevered to receive a $749,000 NIH grant. Alabama Launchpad alumnus company Blondin Bioscience, LLC recently won a highly competitive Phase I Small Business Innovation Research (SBIR) grant from the National Institutes of Health (NIH). When Brad Spencer, CEO of Blondin Bioscience, a University of Alabama at Birmingham-related startup, called to let us know he was ready to apply for accounting compliance assistance through the Alabama Launchpad Phase 0 program, you could hear the excitement in his voice. We, too, got excited when we learned the amount is $749,000 over two years. Phase I awards are often in the $100,000 range. In recent years, NIH has begun making larger awards to fewer companies, so it is a tremendous achievement for Blondin BioScience to win a two-year, $749,000 award. EDPA started the Small Business Innovation Research / Small Technology Transfer Innovation Research SBIR / STTR support program in 2014 after analyzing the success rate of Alabama SBIR / STTR applications across different funding agencies. Although Alabama is consistently ranked in the top 20 states for SBIR awards, the high ranking is bolstered by the success of a number of companies that are adept at getting SBIR funding from the Department of Defense. EDPA saw a strong opportunity to improve the success rate with other agencies, particularly with NIH. Through the Alabama Launchpad business competition, EDPA works every year with a few life science companies. A small award of $50,000 or $100,000 from Launchpad cannot begin to get these companies through the long business gestation period. The timeline to revenue for biotech is so extended, that mentors from Alabama Launchpad’s business competition almost always point the companies to SBIR funding as a viable next source for non-dilutive seed money. Two business plan competitors, Blondin Bioscience and Exscien, listened to this advice. Their persistence and hard work are reaping big rewards. EDPA congratulates the Blondin Bioscience team for its pursuit of NIH funding to advance the pursuit of developing cancer diagnostics. EDPA also applauds Blondin Bioscience for being a model of perseverance and a testimony for other entrepreneurs and Launchpad competitors to not quit. 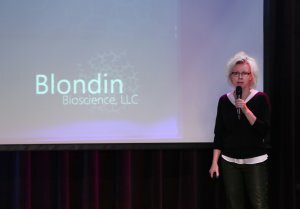 When Blondin Bioscience did not receiving funding after competing twice in Launchpad startup competitions, most recently in 2014, the company became even more motivated to reassess and redirect, according to Spencer. That change in the company’s pitch might be exactly what put Blondin Bioscience over the top in the eyes of NIH. Blondin Bioscience’s success as a company impacts Alabama’s overall success accessing the federal seed funding to grow the life science sector in Alabama. 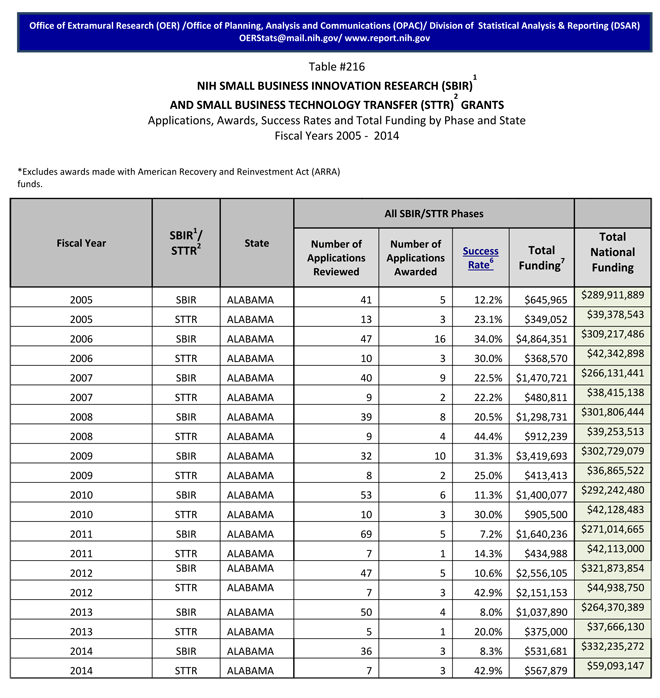 Table # 216 below, compiled by the NIH Office of Extramural Research, shows that Alabama companies regularly submit applications for NIH SBIR / STTR funding. EDPA is committed to the importance of helping Alabama companies improve the success rate in landing more NIH funding. Through Alabama Launchpad, EDPA is building long term relationships with companies like Blondin and Exscien. EDPA is providing help along the capital continuum through commercial assessments, mentoring and funding from the business competition, writing assistance on the SBIR grants, preliminary data cash awards, and accounting compliance. We look forward to seeing the 2015 update to the table below, when it reflects the Blondin win of $749,000 and the Exscien win of $3 million. Good economic development is a relationship business, whether you are recruiting industry or growing your own technology companies. EDPA is grateful to Blondin for the continuing relationship and the opportunity to learn alongside them as we work to develop meaningful assistance programs for startups.